18 Rd6 cxd6 19 gxh5 gxh5 20 Bxg7+ Kxg7 21 Nf7+ Ng6 22 Rxg6+ Kxg6 23 f5+ Kf6 24 Qh4+ Kxf5 25 Qg5+ Ke4 26 Nxd6+ Kd4 27 c3 mate. We published the score on page 169 of the November 1983 CHESS, stating that it had been played between Josef Krejcik and Konrad Krobot in Vienna, 1908. Our source was pages 30-31 of the January 1909 Wiener Schachzeitung, which specified the occasion as follows: ‘gespielt im Café Viktoria, Wien IV, am 14. 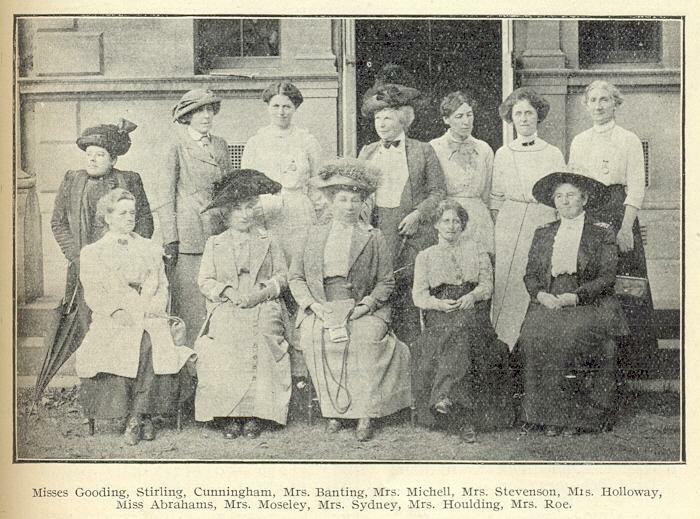 February 1908’. Subsequently, C.N.s 1214 and 1261 pointed out that when the Wiener Schachzeitung repeated the game on pages 224-229 of its August 1924 issue the date was given as 24 February 1909 (see page 229 of that item – although the date 24 February 1908 appeared on page 227); moreover, on page 35 of his book Mein Abschied vom Schach (Berlin, 1955) Krejcik himself put 24 February 1908. This information was given on pages 48-49 of Kings, Commoners and Knaves. In C.N. 2786 (see page 22 of Chess Facts and Fables) we added that 14 February 1908 was the date supplied on page 100 of Deutsches Wochenschach, 15 March 1908, which took the score from the Neues Wiener Tageblatt. See too page 75 of the 28 February 1909 Deutsches Wochenschach. 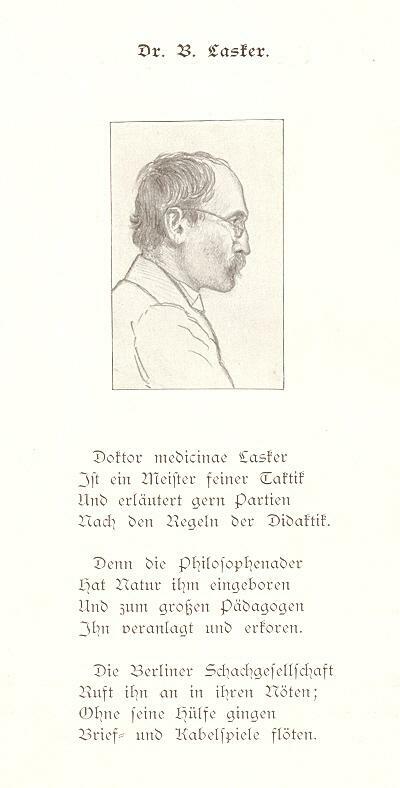 Krejcik was therefore wrong to put 24 February 1909 on page 16 of another of his books, Artige und unartige Kinder der Schachmuse (Leipzig, 1925). We also mentioned in C.N. 2786 that when the game was published in the chess column of the Berner Heim on 4 April 1908, with notes from Bohemia, Black’s name was rendered as ‘Krobst’. Can any further evidence be found about the correct date and whether Krejcik’s opponent was Krobot or Krobst? For a modern set of annotations to the game, by Bent Larsen, readers are referred to pages 22-23 of Kaissiber, October-December 2005. 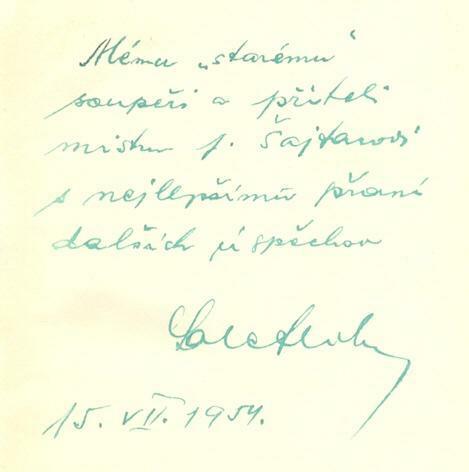 A brief addition to the earlier items: on pages 27-30 of his book 13 Kinder Caïssens (Vienna, 1924) Josef Krejcik presented a fictional article entitled ‘Rousseau als Schachspieler’. 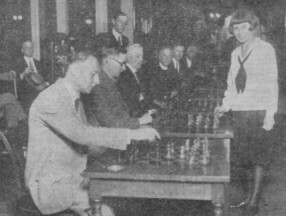 The above photograph, from page 46 of the March 1931 American Chess Bulletin, was taken during the display referred to by Dr Brandreth. Capablanca is standing at a board about half-way down the right-hand side. 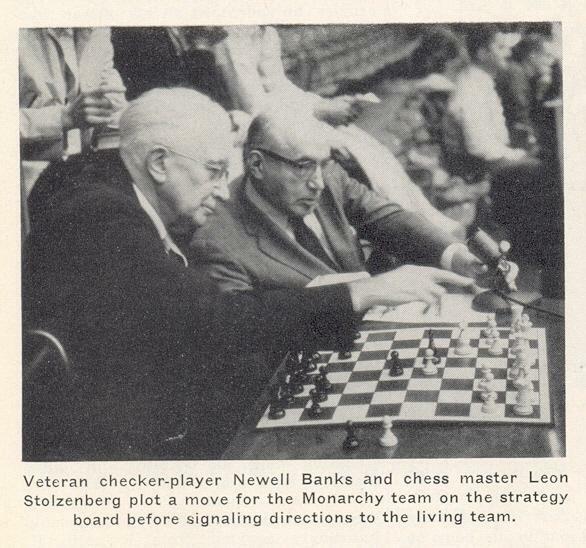 What detailed records exist of Staunton playing simultaneous chess? 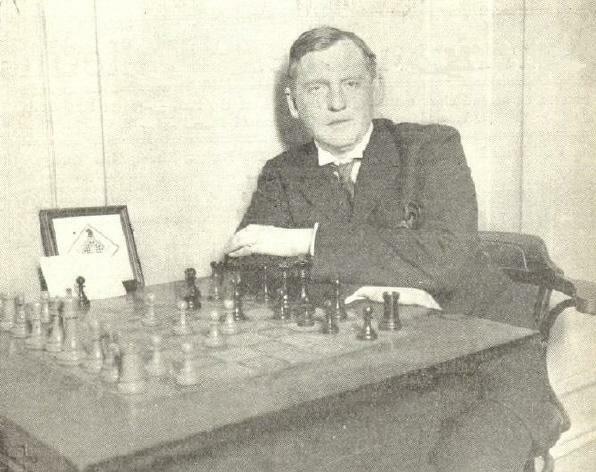 In his Psychology book (page 30) Fine wrote of Staunton, ‘No brilliant games of his have survived ...’, a remark characteristic of much that used to appear about him in US chess literature. Other examples were quoted in our feature article on Frederick Edge; for a particularly ill-natured paragraph about Staunton by Al Horowitz see page 259 of Chess Facts and Fables. ‘Gibaud has been overthrown. Ever since 1924 this French chess master has been revered for achieving defeat in only four moves. A Monsieur Labard [sic] played the walk-on part in this great scene. Martin Weissenberg (Savyon, Israel) mentions that an article by Sjef Houppermans entitled ‘Echecs et autres réussites’ which discussed Roussel and chess was published on pages 303-317 of Echiquiers d’encre by Jacques Berchtold (Geneva, 1998). See also plate 1 in The Machine Plays Chess? by Alex G. Bell (Oxford, 1978). ‘I remember an incident involving Grandmaster Nimzowitsch. He couldn’t bear tobacco smoke, and in one tournament he set as a condition that his opponent should not smoke. His rivals agreed. When Bogoljubow put a full box of cigars on the table before sitting down to play against him, he hurried to the chief umpire in great excitement. The umpire checked up and said, “But Bogoljubow isn’t smoking”. Flohr was not necessarily claiming to have been an eye-witness, but it may be recalled that the incident is usually placed at New York, 1927, where neither Bogoljubow nor Lasker participated. This has become a famous quote, being featured at the start of The Most Instructive Games of Chess Ever Played by Irving Chernev (New York, 1965). Since it is often cited without a source, we should like to know more about the genesis of Flohr’s article in CHESS, which was entitled ‘How to become World Champion’. Was it an original piece for the magazine or a translation from, for instance, a Soviet publication? C.N. 3587 suggested that a candidate for the most famous of all quotes on the game was the alleged old Indian proverb ‘Chess is a sea in which a gnat may drink and an elephant may bathe’. However, we queried its authenticity because our earliest sighting of it was on page 145 of the anthology Chess Pieces by Norman Knight (London, 1949). 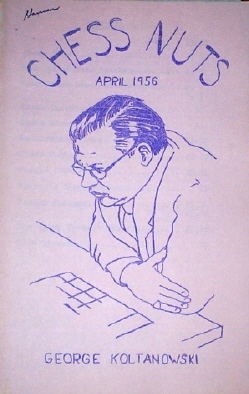 It is not known in which language Koltanowski wrote his article for El Ajedrez Español or, of course, whether the ‘old Indian proverb’ had appeared in print before May 1936. Our correspondent is, in particular, seeking games played by her, and readers’ assistance will be appreciated. C.N.s 1133 and 1154 (see pages 53-54 of Kings, Commoners and Knaves) briefly discussed Mrs Houlding, and in the latter item we commented that examples of her play were rare. 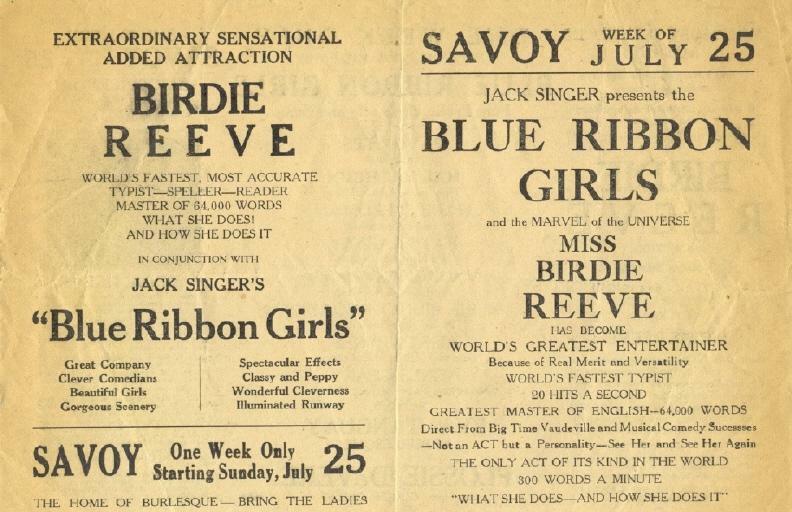 As the best traceable one we gave her first-brilliancy-prize victory over Alice Taylor in the 1909 British Ladies’ Championship in Scarborough. Readers without access to the items from L’Echiquier and Les Cahiers de l’Echiquier Français mentioned in C.N. 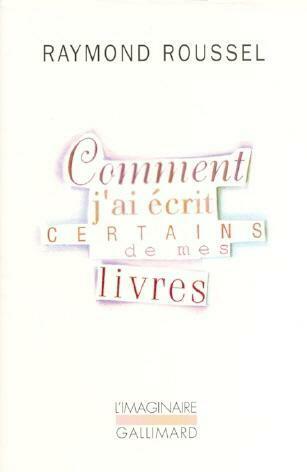 4487 may care to note that they were included on pages 133-160 of Comment j’ai écrit certains de mes livres (1935), a posthumous work by Roussel which is still in print in a paperback edition published by Gallimard, Paris. 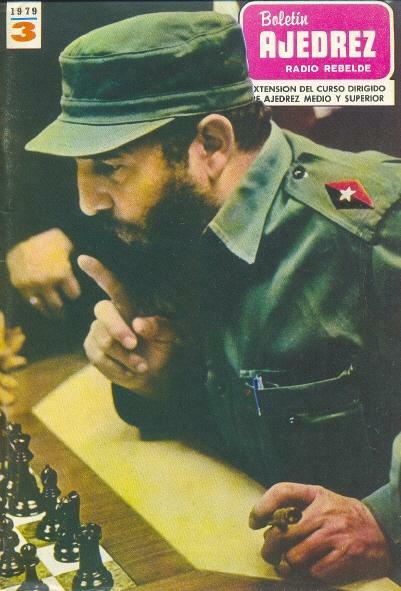 Michael Goeller (East Brunswick, NJ, USA) draws our attention to an article of his dated 2 August 2006 on Fidel Castro and chess. 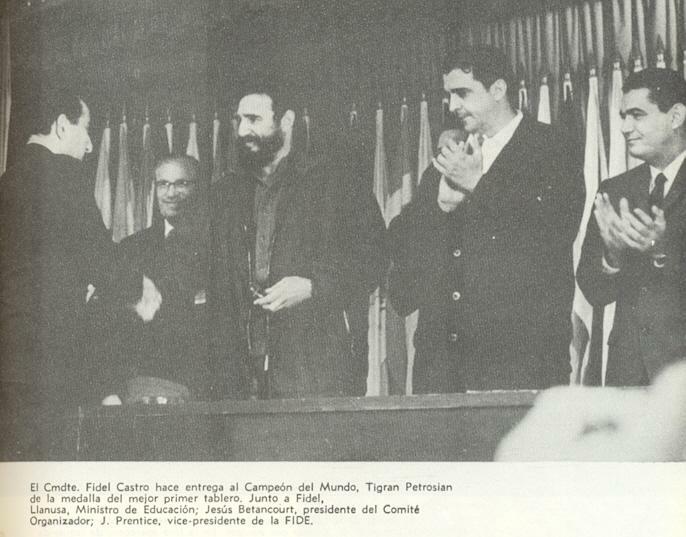 Readers may be able to help him resolve some of the matters discussed, which include Terrazas v Castro (see C.N. 4049). N for knight has become such natural usage in English-language chess writing that its long road to acceptance is easily overlooked. ‘In this magazine the letter S will stand for knight. Our reasons for using it are: First, when Kt is used, should the t be broken off or damaged, the K would remain, and after the student had vainly spent half an hour searching for the move, he would jump up and claw the air and yell for gore. The S knocks the left eye out of any possibility of the introduction of any new gore-shedding process. Second, S is quicker to write. Third, saves time in composition, as one type can be set in less time than two. ‘... as you are open to suggestions, will you permit me to make the following: firstly, that you abandon the use of to and tks for – and x, which are in use in most books; and secondly, that N be used instead of the clumsy Kt for knight. ‘I hail with delight your decision to use N for knight instead of the illogical S. The former is phonetic and reasonable, nor would the late Sir Isaac Pitman detect a weakness in spelling in those who used it. 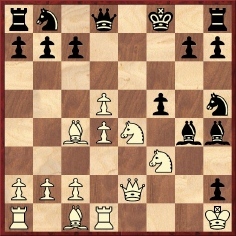 Any attempt, however, to refer to knight and pawns as “N and chickens” should be discouraged and drastically censored. Brock descanted on the subject for over 50 lines more, discussing other possible letters (H for horseman, or C for cavalier, captain or charger) before concluding that Kt should be retained. ‘What I would like to see, however, is the general use of N for knight. All the columns in Australia use it now, except Gundersen’s, and the ACR will soon follow. I am going to circularize all English and American columns and magazines, but of course the BCM sets the standard. 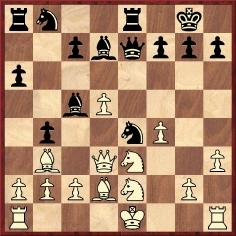 The Australasian Chess Review thus switched from Kt to N in the mid-1930s, and Chess Review did so about a decade later. 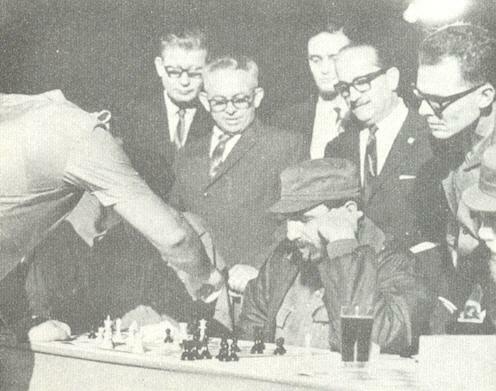 CHESS changed in the 1950s, and the BCM in the 1970s. 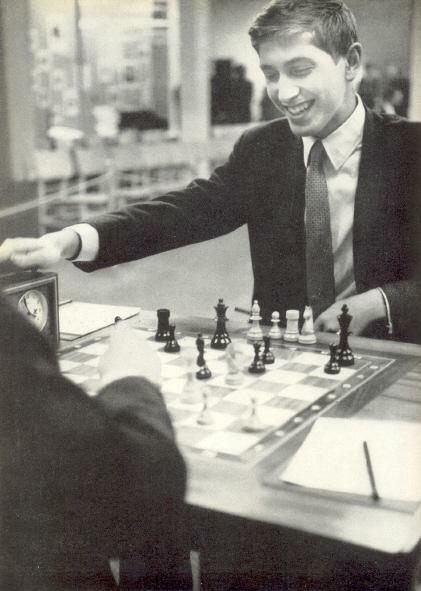 We have been unable to match the position with any recorded Fischer game. ‘The story was also told by Gerard Oskam on page 41 of Schaakmat, February 1951. He wrote that Aron Nimzowitsch set the condition that there should be no smoking by his opponents, who included H. Weenink (1892-1931). Oskam stated that the incident occurred before the game between Nimzowitsch and Tartakower, and he reproduced dialogue allegedly exchanged between the two masters. There are, though, problems with Oskam’s story. He said that it happened in Liège in 1923, but no such tournament took place. 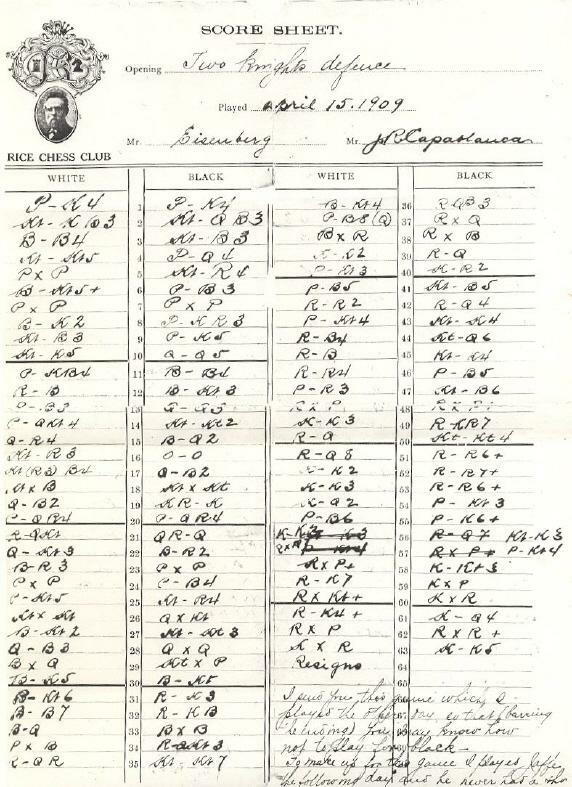 Nimzowitsch, Tartakower and Weenink did participate in Liège, 1930, but Oskam stated that it took Nimzowitsch 35 minutes to make his first move, 1 e4; at Liège, 1930 Nimzowitsch was Black against Tartakower, in a Caro-Kann Defence which was drawn after 20 moves. In fact, Oskam’s article indicated that Tartakower was not a smoker, which is corroborated by Kmoch and Reinfeld’s list quoted on page 235 of A Chess Omnibus. The smoking anecdote was also related by G. Koltanowski on pages 441-442 of CHESS, 14 August 1936. He called it ‘an old but very good story’ which had occurred ‘years ago’ in ‘a double round tournament’ and he spread out the action, involving Nimzowitsch and Vidmar (plus pipe), over the two rounds in which they faced each other. Nimzowitsch was stated to have complained to Maróczy, the tournament director. That suggests New York, 1927, except that it was not ‘a double round tournament’. As so often, Koltanowski purported to present the actual words spoken by the protagonists, but when he related the story again on page 13 of his 1968 book TV Chess, the actual words were altogether different. On page 64 of TV Chess G. Koltanowski affirmed that the game went 1 e4 f6 2 d4 g5 3 Qh5 mate and occurred between players named Mayfield and Trent at the US Open at St Louis. Can any reader throw light on the passage below about Fritz Sämisch which comes from page 87 of Koltanowski’s TV Chess? 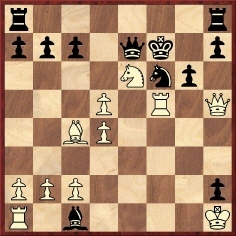 ‘When he started in his first important tournament in Berlin, 1920, he took an hour for his first move, 25 minutes for his second move, 15 minutes for his third move, ten minutes for his fourth move, five minutes for his fifth move, and from then on, he would play the rest of the game in rapid-transit style, having only five minutes left for 35 moves. Most of his opponents used to go beserk [sic], waiting around for him to move. They wondered if he was up to something deep, or new, or was just balmy. But when Sämisch started to play rapid-transit chess, they would follow suit, because they felt Sämisch did not have much time on his clock. They were sure that if they played fast, he would soon blunder. Euwe’s reply is not to be taken literally, and we wonder whether readers can submit any little-known sparklers from old publications. 22...Bxf4 23 Qd1 Re2 24 Na3 Qh6 25 Rxf4 Qxf4 26 Nf3 Bg4 27 Qg1 Bxf3 28 Rf1 Bxg2+ 29 Qxg2 Re1 30 Kg1 Qxf1+ 31 Qxf1 Rxf1+ and wins. Source: Lasker’s Chess Magazine, July 1906, page 121. ‘Q: Why does EG use “S” for knight? 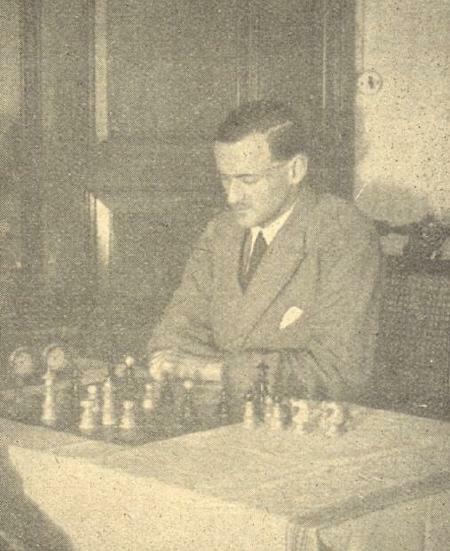 Michael Negele (Wuppertal, Germany) has sent us a rare photograph of Emanuel Lasker’s brother, Berthold, which appeared on page 47 of a biography of Berthold’s wife, Else Lasker-Schüler by Sigrid Bauschinger. The book was first published in 2004 by Wallstein Verlag, Göttingen and is now also available as a paperback (Suhrkamp). The source of the photograph is the Stadtbibliothek Wuppertal, from which our correspondent has received permission for it to be reproduced here. 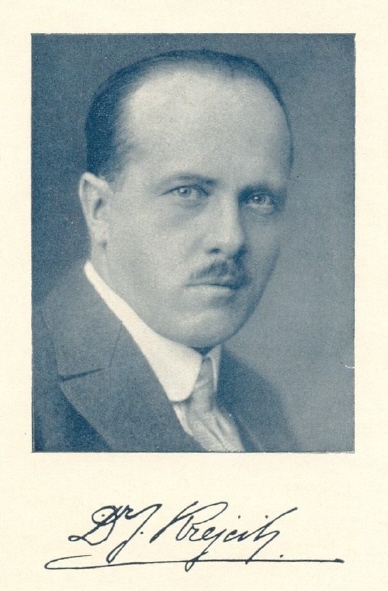 Courtesy of the Stadtbibliothek Wuppertal, Else Lasker-Schüler Archiv (Mr Henry Schneider). 33 Be5 Rxf2 34 Bxf6+ Rxf6 35 Rf1 Rxf1+ 36 Kxf1 Kg8 37 Kf2 Bb5 38 Ke3 Resigns. 38 Rxe6 Qxe6 39 Qxe6+ Rxe6 40 Nc5 Ree3 41 Nxb3 Rxb3 42 Kf2 d3 43 Ke3 Kf7 44 g4 Ke6 45 Ke4 g6 46 Kd4 h5 47 gxh5 Drawn. White in the latter game is sometimes incorrectly given as Emanuel Lasker. The position below was given in C.N. 354, taken from page 12 of the January 1909 Wiener Schachzeitung. 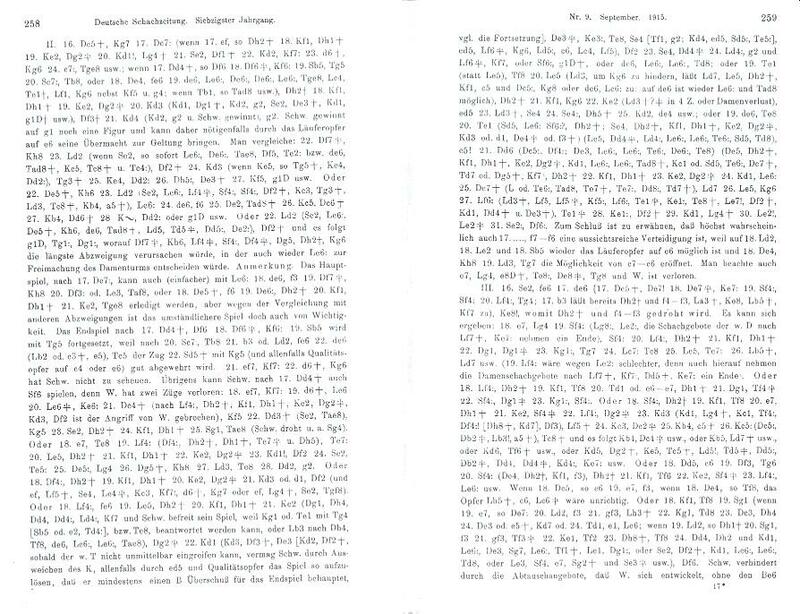 It occurred in a simultaneous exhibition (+ 21 –2 =6) between F.J. Marshall and Dr Hartlaub in Hamburg on 15 December 1908. Marshall won with 1 Ra8+ Kb7 2 Ra7+ Kb6 3 Ra6+ Kb7 4 e3 Rh1+ 5 Ke2 Rh2+ 6 Kd3 Rxb2 7 Rxb2 c5 8 bxc6+ Kxa6 9 c7 Qf5+ 10 Nxf5 Ka7 11 c8(R) Resigns. Is it possible to find the complete game-score in a newspaper of the time? “How will my game improve if I don’t play?” He enjoyed playing, and the whole point of bettering his game was so he could enjoy it more. “Of course”, I replied, “you want to play better, but playing won’t teach you enough, fast enough, or clearly enough, to make you the good player you want to be. You should read rather than play – study rather than stumble along.” Playing only reinforces bad habits (if they are bad to begin with), I told him. Learn the right way; play by yourself with some books for a year, and then go back to club play. 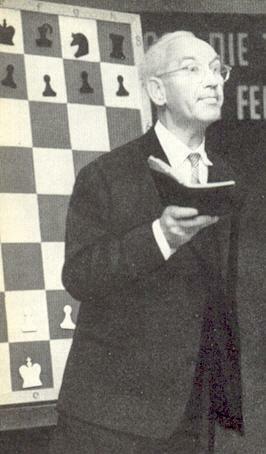 Reinfeld’s article then recommended his series, The First Book of Chess, The Second Book of Chess, etc. 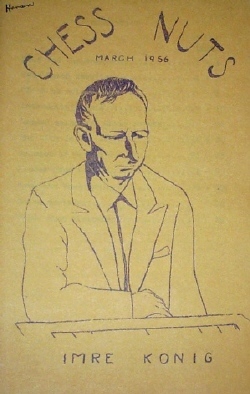 There were eventually eight volumes in all, published between 1952 and 1957, the first being co-authored with Al Horowitz. The book then quoted a letter dated 23 January 1916 to Isaac Rice’s widow from the President of the San Quentin Chess Club, Peter Clandeanos [sic], requesting information about the Rice Gambit. He gave further details about the club’s activities on page 119 of the May-June 1916 American Chess Bulletin. 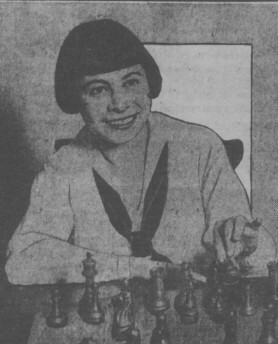 Mrs Rice survived her husband by 14 years, and page 213 of the December 1929 American Chess Bulletin stated that her death was ‘reported at Deal, NJ on 4 November’. For further information about The Star of Hope, see page 124 of the American Chess Bulletin, June 1912. Pages 292-300 had a biographical account which will be reduced here to the basics. 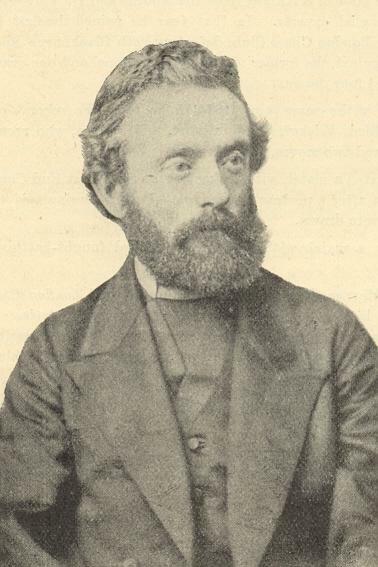 Isaac Leopold Rice was born in Wachenheim, Bavaria, Germany on 22 February 1850, the son of Maier and Fanny (Sohn) Rice. The family emigrated to the United States, and Isaac was educated at the Central High School in Philadelphia. He graduated in 1880 from the Columbia Law School with the degree of LL.B. 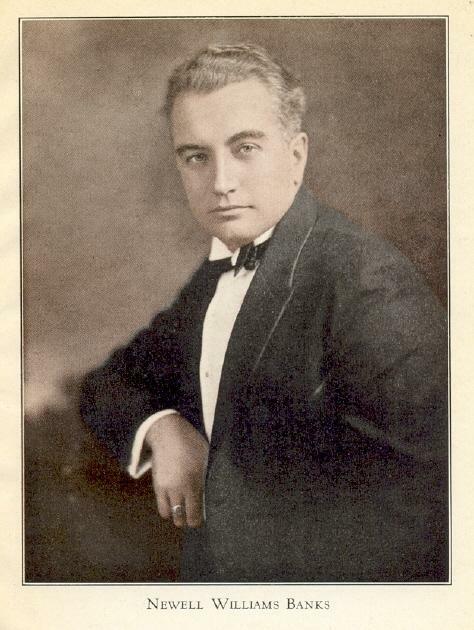 In 1902 he received from Bates College the degree of LL.D. In 1885 he married Julia Hyneman Barnett in New York City, and the couple had six children: Muriel, Dorothy, Isaac Leopold Junior, Marion, Marjorie and Julian. Professor Rice was instructor at the Columbia Law School and lecturer at the School of Political Science until 1886, when he resigned and devoted himself exclusively to railroad law. He reorganized railroad companies in Brooklyn, St Louis and Texas and also became the virtual founder of the storage battery industry in the United States. He was the founder of the electric automobile industry by organizing the Electric Vehicle Company, of which he became the first president. Other companies in which he became involved included the Electric Boat Company, the Consolidated Railway Lighting and Refrigerating Company and the Forum Publishing Company. 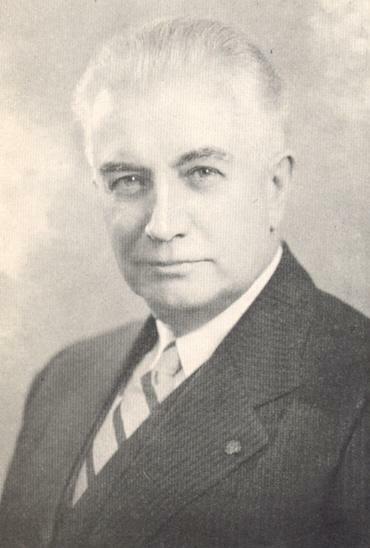 He contributed articles to the North American Review, Forum and Century. 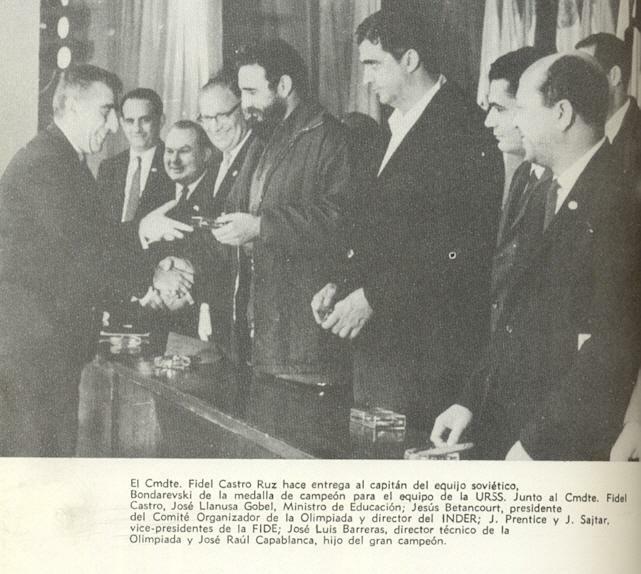 His munificence in the chess world included the gift of an international trophy worth about $1,300 which was competed for in matches between British universities (Oxford and Cambridge) and such US establishments as Columbia, Harvard and Yale. His home, the Villa Julia on Riverside Drive, New York, had a chess room which was hewn out of the solid rock in the basement and was accessible by an automatic elevator which communicated with the floors above. Rice donated huge sums to chess activity far beyond his gambit, and he was regarded, at least in the United States, as the chess world’s leading patron. ‘Maecenas is dead’ was the title of a poem by Maxwell Bukofzer on pages 286-287 of the above-mentioned book on the gambit. After Rice died, on 2 November 1915, the American Chess Bulletin took the unprecedented step of issuing a lengthy ‘memorial supplement’ (pages 257-303). Much of the material later appeared in the book. 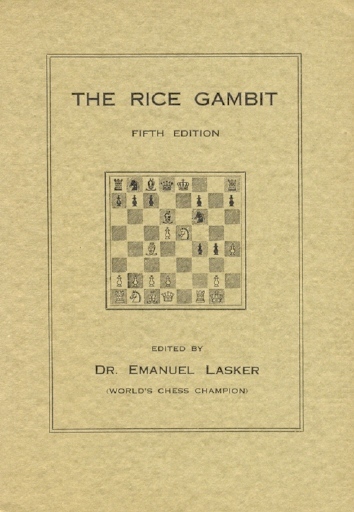 As background information on Rice pages 381-386 of the book gave the score of a game won by him in the pre-Rice Gambit days. It had detailed notes by Steinitz from the New York Tribune, but only a few of them are cited below. 22 d6 (‘White’s play in the main deserves special marks of distinction.’) 22...cxd6 23 Rxf6+ (‘Quite in keeping with the fine quality of the preceding train of moves on White’s part.’) 23...Qxf6 24 Qd5 (‘White administers the quietus with this very clever stroke.’) 24...b5 25 Qb7+ Qe7 26 Ng5+ Kf6 27 Ne4+ Qxe4+ 28 Qxe4 and wins. An earlier specimen of Rice’s play is given here from pages 45-46 of the 15 December 1883 issue of the Brooklyn Chess Chronicle. Played at the Manhattan Chess Club, it was one of 12 blindfold games played simultaneously by White. 15 d6 Bxd6 16 g3 Nc5 17 Qd5 Bc6 18 Qxf7+ Qxf7 19 Bxf7+ Kxf7 20 Rg1 Ne4 21 c3 Bc5 22 Nd4 bxc3 23 bxc3 Nxc3 24 Bxc3 Rxe3+ 25 Kd2 Re4 26 Kd3 Bd5 27 Rae1 Rxe1 28 Rxe1 Bxd4 29 Kxd4 Bxa2 30 Kc5 Nd7+ 31 Kc6 Nf6 32 Bxf6 Kxf6 33 Kxc7 a5 34 g4 a4 35 Kb6 Bb3 36 Kb5 Rb8+ 37 Ka5 a3 38 Ka6 a2 39 Ra1 Bc4+ 40 White resigns. 18 Rdf1 Rd7 19 Bg4 Be6 20 Bxe6 Qxe6 21 Qxf7+ Qxf7 22 Rxf7 Nxd4 23 Nd5 Ndf5 24 R1xf5 Nxf5 25 Rxf5 Kd8 26 c4 b6 27 Bf8 Ke8 28 e6 Rxd5 29 cxd5 Rxf8 30 Rxf8+ Kxf8 31 d6 g5 32 g4 Resigns. Source: Brooklyn Chess Chronicle, 15 September 1884, page 186. Now we return to the Rice Gambit. The Professor explained how it came about in the first edition of a monograph on the opening, published in 1898. The account was reproduced on pages 342-344 of Twenty Years of the Rice Gambit. ‘During the winter of 1890-91 I had the privilege of playing a long series of practice games with Mr William Steinitz, in the course of which I frequently essayed the Kieseritzky Gambit. Mr Steinitz was of the opinion that the attack could find no satisfactory continuation against the following: 1 e4 e5 2 f4 exf4 3 Nf3 g5 4 h4 g4 5 Ne5 Nf6 6 Bc4 d5 7 exd5 Bd6 8 d4 Nh5, followed by 9... c5. 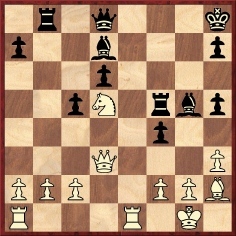 In the course of these games I made many attempts to discover a winning move for White, but without success. 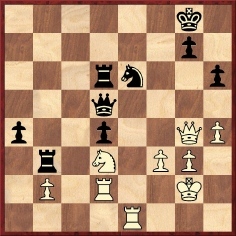 Nevertheless, the problem interested me so much that, whenever I had the opportunity, I played the Kieseritzky Gambit. 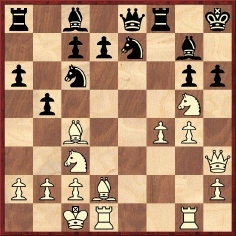 I did not deviate from known lines until the spring of 1893, when I tried the innovation of 9 Bxf4, followed by castling. This, I found, led to a quite protracted attack, which seemed to offer some winning chances. Among others, Mr Reichhelm noticed it, and published a short account of it in the Philadelphia Times of 7 June 1893, under the heading “The Rice Attack”. I finally became convinced, however, that the attack was not sound. Notwithstanding these failures, I did not abandon my efforts, and about a year ago it occurred to me that the knight, and not the bishop, should be sacrificed. After some private analysis I ventured upon the innovation in off-hand games at the Manhattan Chess Club, enlisting as opponents some of the best players of that club. 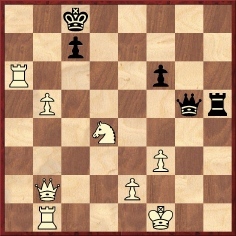 As a result of these games, I felt justified in the conclusion that the sacrifice secured at least an even, if not a better, game for White and that, therefore, it was sound. I then was fortunate enough to interest Mr S. Lipschütz, who made a thorough analysis of the gambit with me, testing the same in numerous contests over the board. By reason of this analysis, so many novel positions were brought about that I thought the chess world generally might like to become acquainted with the new continuation and, as Mr Lipschütz kindly consented to act as editor, I decided to publish. ‘... Let, therefore, the gambit again come into its own. Let us admit, which is most probably true, that the gambit will not yield to the first player as high a percentage of wins as the Ruy López or the queen’s pawn; but let us therefore not sacrifice the beauty hidden in the gambit. I hope that this book will be the forerunner of a number of bigger books devoted to a thorough, accurate and imaginative analysis of all those gambit openings, of which the endeavor of former masters has not been able to unravel the mystery fully. 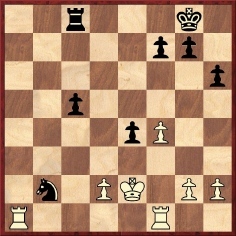 It was in 1895 that Mr Rice had the idea of sacrificing the knight in that manner which brings about the gambit named after him, and ever since that time he has had a lively struggle against those who scorned that move. Within these 15 years Mr Rice has had to acknowledge defeat as often as Wilhelm von Oranje in his fight against the Spanish, but as often as that great prince has he collected his scattered forces and made an army of them and again given battle, and finally he has achieved the same triumph. The foe was driven, often after a hard and long struggle, from each position that it had hoped to maintain, and the truth finally prevailed. ‘... I received my education in chess when what was called the modern school was all dominant, and I was taught that all forms of King’s Gambits must be eschewed as unworthy of a serious votary. I was also taught that if there was an exception to this, it could only be the Kieseritzky Gambit, but that even that gambit had finally to be abandoned as leading to unavoidable disaster. ‘The Rice Gambit’ by C.E. Ranken, BCM, March 1898, pages 104-106. ‘The Rice Gambit’ by E. Kemeny (from the Ledger), American Chess Magazine, October 1898, page 187. ‘Gambit Rice’ by E. Crespi, La Stratégie, 15 January 1901, pages 3-4. ‘The Rice Gambit’, Checkmate, February 1901, page 21. ‘The Rice Gambit Again’, Checkmate, March 1901, page 41. ‘The Rice Gambit’ by W.E. Napier, American Chess World, April 1901, page 82. ‘The Rice Gambit’ (from the Brooklyn Eagle), Checkmate, June 1903, page 208. ‘Rice Gambit Explorers’ by W.E. Napier (from the Pittsburg Dispatch), Checkmate, July 1903, page 233. 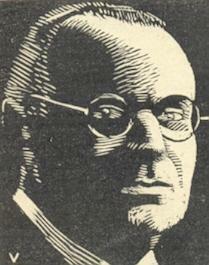 ‘Professor I.L. Rice’ (from the Brooklyn Eagle), Checkmate, April 1904, page 126. ‘The Rice Gambit’, American Chess Bulletin, June 1904, pages 34-39. ‘Rice Trophy for Hamilton College’, including the text of an address by Rice, American Chess Bulletin, October 1905, pages 316-317. ‘The Rice Gambit’, Lasker’s Chess Magazine, October 1905, pages 241-243. 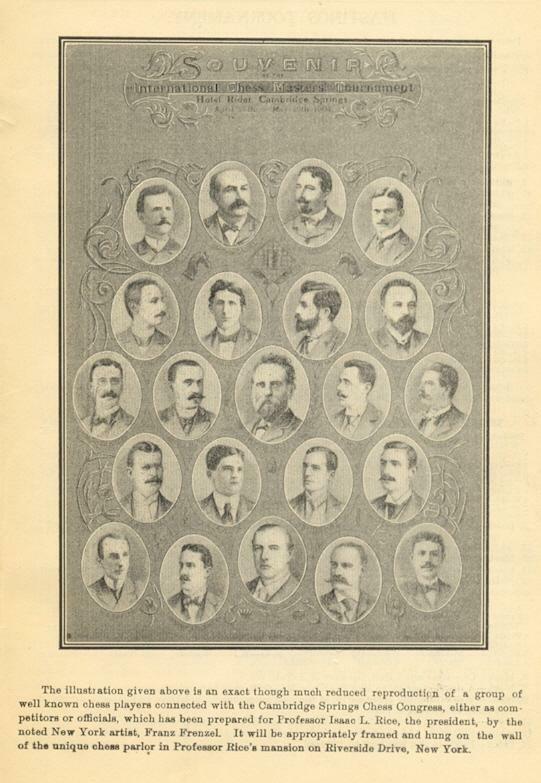 ‘Professor Rice, His Trophies and Gambit’, American Chess Bulletin, January 1906, pages 12-14. ‘The Rice Gambit’, American Chess Bulletin, February 1906, page 27. ‘Chess and War’, Lasker’s Chess Magazine, November 1907, page 35. ‘The Rice Gambit’ (letter from Rice), Chess Amateur, February 1908, page 159. 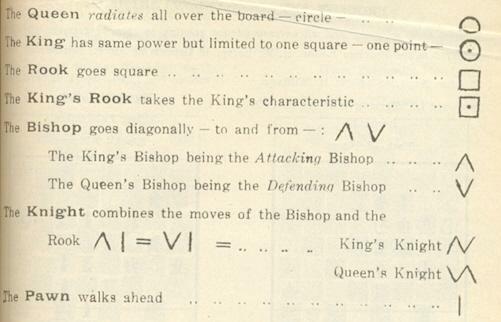 ‘Rice Gambit Accepted’, Chess Amateur, March 1908, pages 173-174. 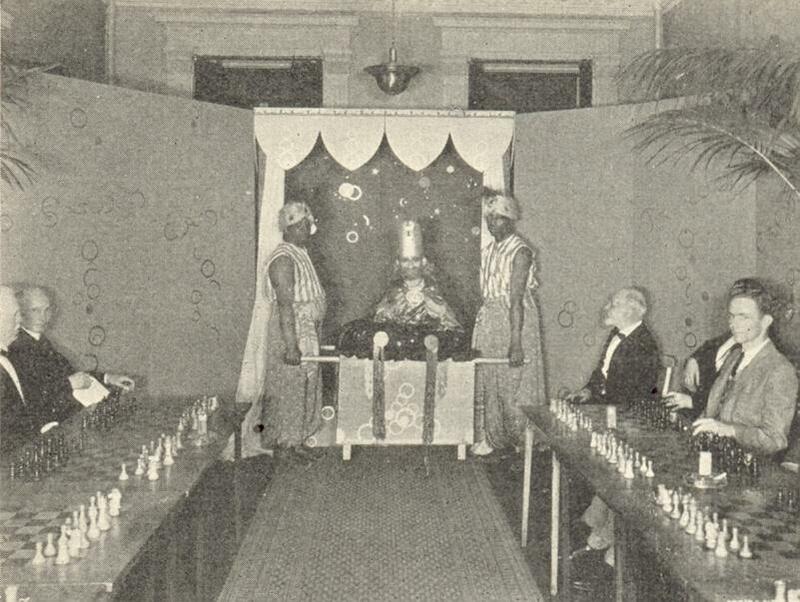 ‘The Rice Gambit in Action’, American Chess Bulletin, March 1908, page 47. ‘The Rice Gambit’, Chess Amateur, June 1909, page 265. ‘Etude sur le gambit Rice’, La Stratégie, August 1908, pages 247-249. ‘Rice Gambit Suffers Relapse’, Chess Weekly, 22 August 1908, page 92. 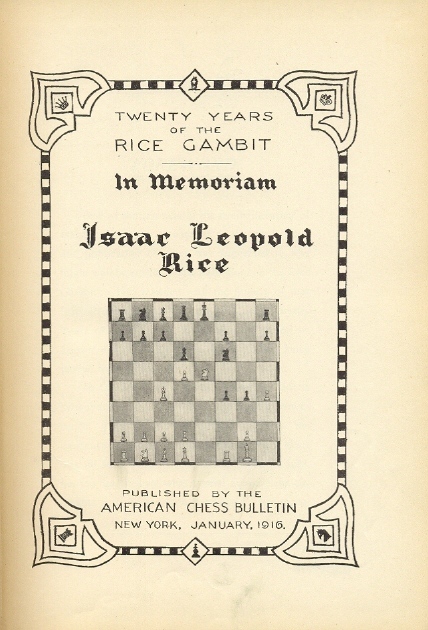 ‘The Rice Gambit’, Supplement in American Chess Bulletin, May 1909, pages 1-17. ‘The Rice Gambit’, Chess Weekly, 18 September 1909, page 131. ‘The Rice Gambit’, Chess Weekly, 25 September 1909, page 138. ‘The Rice Gambit’, letter from Rice, American Chess Bulletin, April 1910, pages 84-86. ‘The Rice Gambit’ by H. Keidanz, American Chess Bulletin, May 1910, pages 121-135. 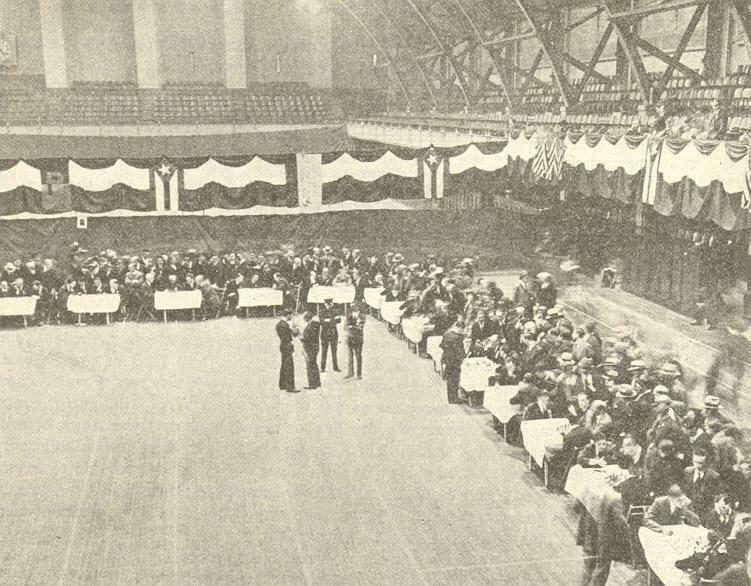 ‘Rice Gambit Test in Philadelphia’, American Chess Bulletin, January 1911, pages 7-8. ‘Zur Theorie des Ricegambit’ by J. Krejcik, Wiener Schachzeitung, March-April 1915, pages 59-64. ‘Zum Kieseritzky-Gambit, Rice-Abzweigung’ by J. Berger, Deutsche Schachzeitung, July 1915, pages 193-194; September 1915, pages 257-263; October 1915, pages 289-292. 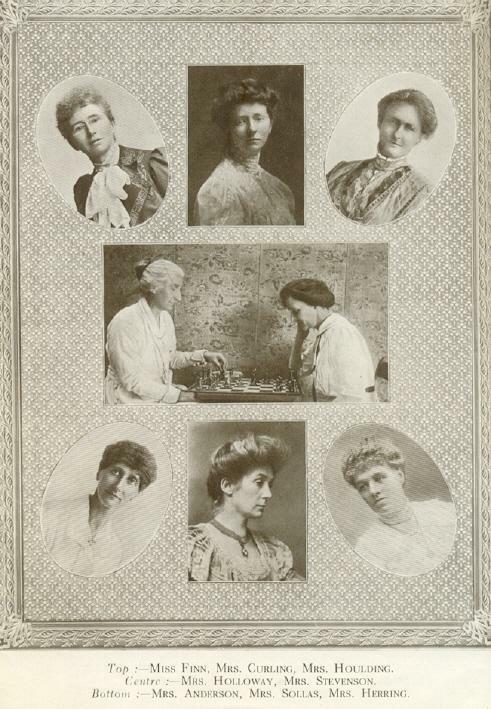 This comes from page 95 of the October 1904 American Chess Bulletin. Most of the photographs are readily identifiable, and readers may care to put together a full list. The name of the Café, Veronika, may be noted. Sources quoted in C.N. 4490 had Viktoria and Victoria. We are grateful to Mr Anderberg for a correction to C.N. 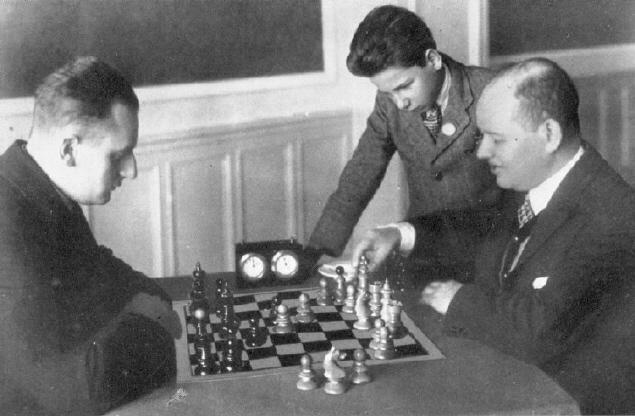 3845: Stoltz won the 1930 match against Spielmann, with a score of +2 –1 =3. Our correspondent quotes page 358 of the December 1930 Deutsche Schachzeitung, and we add the following from page 266 of the Swedish magazine Schackvärlden, November 1930: ‘Stoltz besegrade Spielmann med 3½ p. mot 2½’. 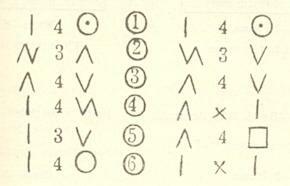 It is curious that some later secondary sources gave Spielmann as the winner, by +3 –2 =1. See, for instance, page 342 of the Dizionario enciclopedico degli scacchi by A. Chicco and G. Porreca (Milan, 1971). An unresolved matter from C.N. 4470 is why a number of computer chess books affirm that Leonardo Torres y Quevedo invented his chess computer as early as 1890, rather than in 1912-14. The Italianization does not inspire confidence, and no source for the information was offered. Can a reader move the matter on from the ‘apparently’ stage to some hard facts? 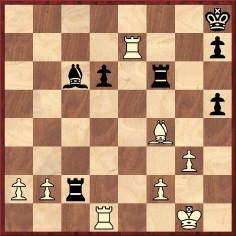 Black won with 1...Qd6 2 R6f2 Nf3+ 3 Kh1 Qh2+ 4 Rxh2 Rxh2 mate. Source: Schach-Echo, 5 March 1960, page 73. Is the full game-score extant? 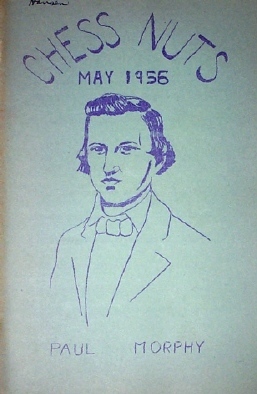 Source: American Chess Bulletin, May-June 1933, page 83. Game 6 (18 November): Stoltz v Spielmann ½-½. The Stockholm Schacksällskap had organized an international tournament to celebrate Ludwig Colllijn’s 25th year as club president. The tournament (20-25 October 1930) had seven players; Kashdan, who lost to Spielmann, won with 4½ points (+4 –1 =1). Then came Bogoljubow and Stoltz with 4 points, followed by Ståhlberg (3), Spielmann (2½), Rellstab (2) and Lundin (1). Spielmann lost to Stoltz and Bogoljubow. 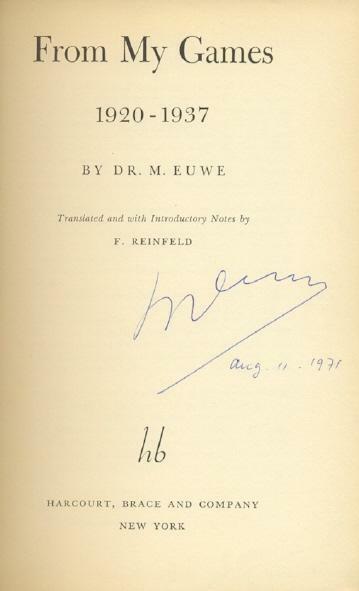 ‘Unquestionably, the most important single contribution to chess literature has been Nimzowitsch’s Mein System (My System in the English version). ... 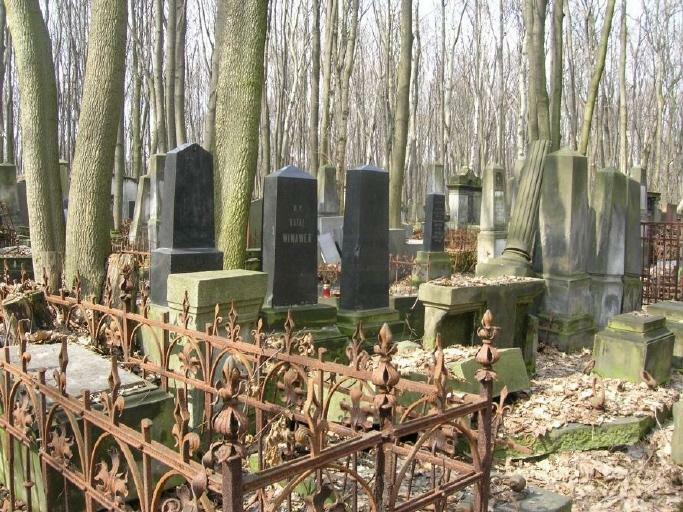 Although the individual Nimzowitsch is dead, he lives on collectively in every chess master to a greater or less degree. Thus Korchnoi is really Korchnoi plus Nimzowitsch, and so forth. 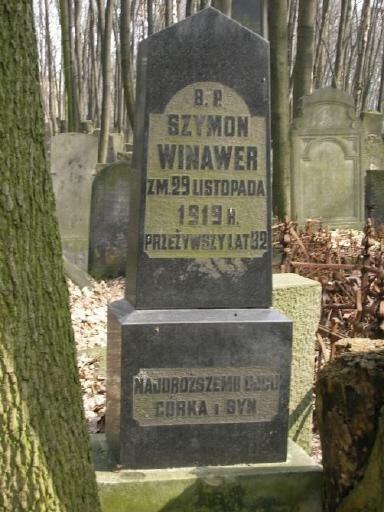 Some masters show little of Nimzowitsch in their styles, but all have been influenced by him. C.N. 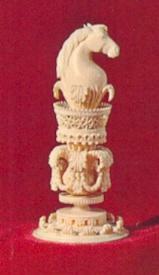 2967 (see page 322 of Chess Facts and Fables) discussed the poetry of A.E. Santasiere, quoting a clemently brief sample. 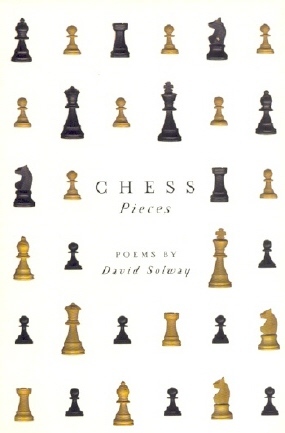 It may be added that page 3 of Santasiere’s book Essay on Chess (Dallas, 1972) stated that among his output ‘there are three volumes of poetry; one of essays’. On page 160 of the March 1977 Chess Life & Review Santasiere’s obituary contained the assertion ‘at least three volumes of verse’. Have any readers seen them? Another US figure who died in 1977 (an event accorded three lines on page 257 of the May Chess Life & Review) was Newell Banks, ‘one of the world’s leading checker players and a chess master’. More information about that game is sought. 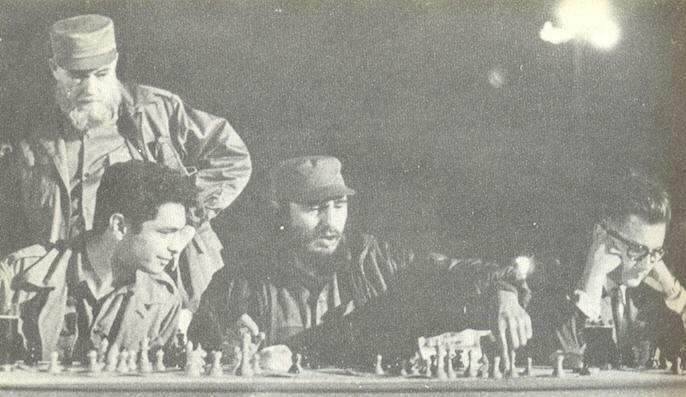 As regards simultaneous displays, in 1909 the Cuban gave two in Kansas City, on 4 February (four losses) and on 4 December (one loss), as listed in the American Chess Bulletin (March 1909, page 59 and February 1910, page 28). Was Banks the winner in the latter exhibition? In 1987 a local librarian informed us that he had found no mention of Capablanca’s visit in the Kansas City Times and Star of the time, but perhaps a reader could kindly look into the matter. A small addition to C.N. 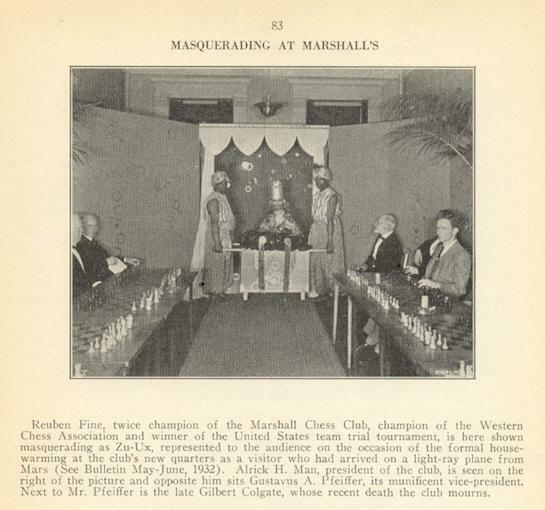 3405 (see pages 309-310 of Chess Facts and Fables) concerns the identity of the onlooker in the above photograph of Gilg and Spielmann at Semmering, 1926, which was reproduced from the tournament book. 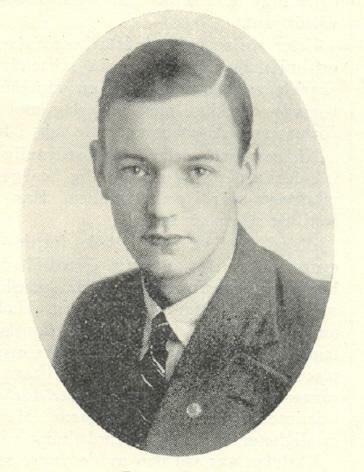 When the picture was published on page 143 of the November 1926 American Chess Bulletin he was identified as ‘Washburn Jr., son of the American Ambassador in Vienna’. As already seen in C.N. 4505, Oskam’s stories need to be read guardedly. In any case, we recall only ‘normal’ score-sheets in Rubinstein’s hand. See, for example, page 225 of Akiba Rubinstein: The Later Years by John Donaldson and Nikolay Minev (Seattle, 1995). ‘How many readers know which is the earliest printed book with chess content? The answer is Johannes Gallensis’ (John of Waleys) Summa Collationum (Cologne, Ulrich Zel, about 1470). The information in parentheses is not explicitly present in the book, and has been established by research. At the time Murray did his History of Chess the date of publication had not been settled by scholars, which is no doubt why none of the modern reference works mentions this as an important first. The chess section of Johannes’ book is a few pages long and is (of course) on morality. Murray gives an account at the start of chapter 5. Caxton’s chess (1476) is now of less interest: it is not the first book published by Caxton; it is not the first book published in English, and it is not the first book with chess content. 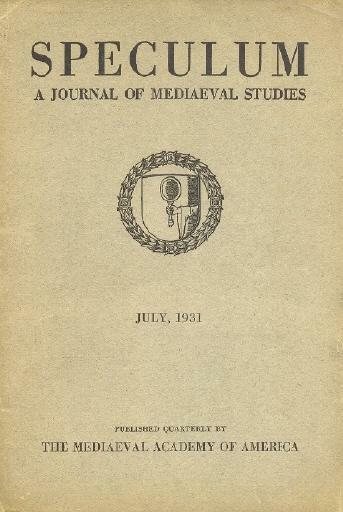 We have recently been reading an academic article about Johannes Gallensis, ‘All the World’s a Chess-board’ by Lynn Thorndike of Columbia University on pages 461-465 of Speculum, July 1931. Thorndike’s article, about half of which comprised text in Latin, would be impossible to summarize here, but it too merits the term ‘erudite’, and we should like to know of any other chess writings by him. Alekhine v O. Tenner in Cologne. 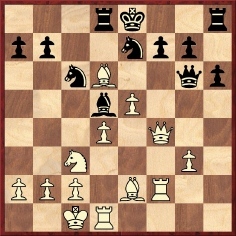 See page 54 of Alexander Alekhine’s Chess Games, 1902-1946 by L.M. Skinner and R.G.P. Verhoeven (Jefferson, 1998). The so-called five queens game against N. Grigoriev, Moscow, 1915. 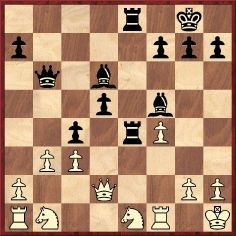 It was the subject of a superb chapter (pages 54-66) in Chess Curiosities by Tim Krabbé (London, 1985). A. Evenssohn v Alekhine, Kiev, 1916. See pages 176-177 of Chess Explorations. Alekhine v Feldt, Tarnopol, 1916. The game was discussed in C.N.s 783, 1191 and 1360. See also pages 120-121 of the Skinner/Verhoeven book. Alekhine v A. Frieman (Freeman, according to Alekhine), New York, 1924. See pages 17-18 of Chess Explorations. Once again we express the hope that a reader suitably placed can look into Capablanca v Banks, Kansas City, 1909. Following on from the recent items about Newell W. Banks (C.N.s 4531 and 4539), our intention was to give one or two little-known victories by him, but it is proving surprisingly difficult to find suitable game-scores. Any suggestions from readers will therefore be appreciated. Another loose end is Banks’ second forename. ‘Banks played his first game of blindfold checkers at age five years and six months at the Detroit Chess and Checker Club. Mr Banks has traveled over 1,000,000 miles in the past 45 years and played about 600,000 checkers and chess games. During this time he has played over 80,000 blindfold games, which is a number that probably exceeds more than that of [sic] any three blindfold players combined in the past. At the present time, Mr Banks holds all speed records at blindfold and simultaneous checkers; namely 20 games blindfold at one time in 2 hours and 25 minutes at Bethlehem, PA in 1933, winning 17, drawing 3. At the Century of Progress in Chicago, in 1933, Mr Banks played 140 games of checkers simultaneously in 145 minutes – winning 133, drawing 7, and making an average of about one move per second. 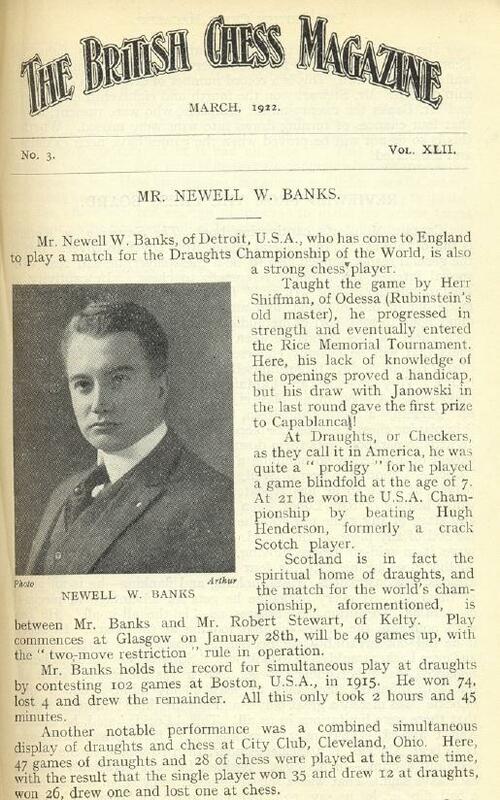 Newell W. Banks holds the world’s championship speed record at mixed play, having played 75 checkers and 25 chess games simultaneously, and at the same time six games of blindfold checkers in four hours’ time (240 minutes), winning 65 checkers games, drawing 10, winning 4 blindfold and drawing 2, winning 22 chess games, drawing 2 and losing only 1. 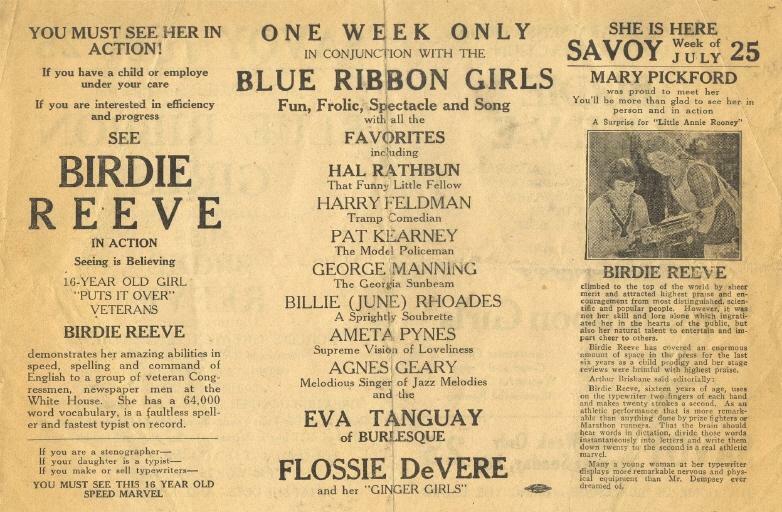 This exhibition was held at the Tuller Hotel, Detroit, in 1932. Mr Banks at age 60 set [an] endurance blindfold record that is one of the world’s wonders. He played four hours per day for 45 consecutive days, winning 1,331, drawing 54 and losing 2, playing 6 games at a time. He set a new blindfold speed record playing 62 games in four hours, winning 61 and 1 drawn at Convention Hall, Detroit, MI, during this endurance record. 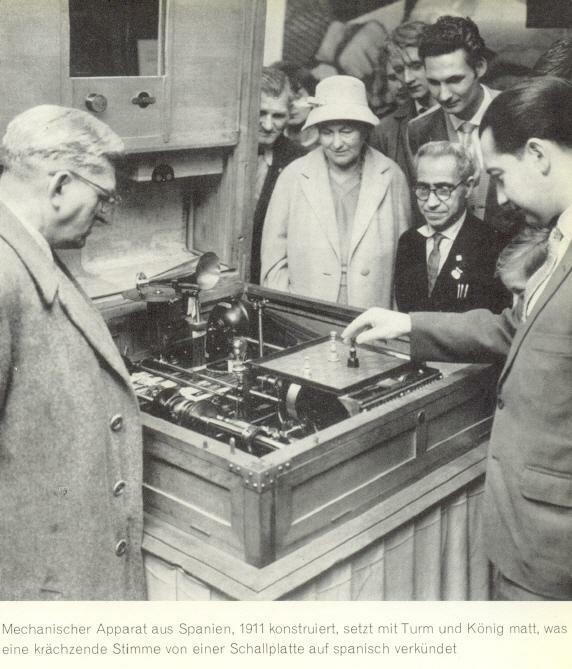 Can readers point out any articles by, or interviews with, Sämisch in which he explained his handling of the chess clock? The entry ‘World champion (early uses of the term)’ has many references in our Factfinder, and a valuable addition has now come from Robert John McCrary (Columbia, SC, USA). 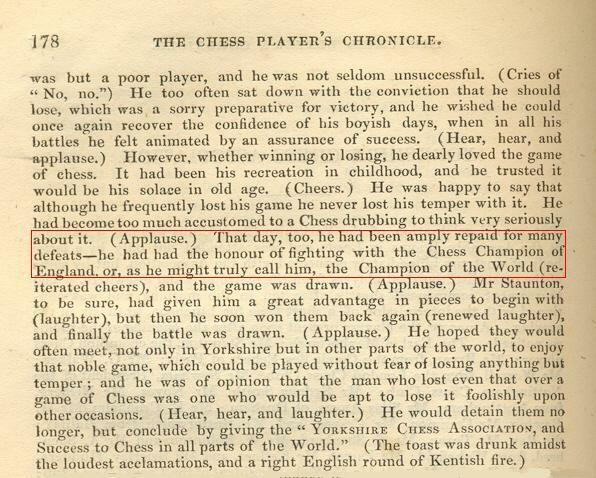 Pages 177-182 of the 1845 Chess Player’s Chronicle (with the cover date 1846) carried a report on the annual celebration of the Yorkshire Chess Clubs in Leeds, chaired by the Earl of Mexborough and with Howard Staunton in attendance. The report of the Earl’s speech included the following description of Staunton: ‘... the Chess Champion of England, or, as he might truly call him, the Champion of the World’. Quite a few readers correctly identified Viacheslav Ragozin. The photograph came from page 298 of XIV. Schach-Olympiade Leipzig 1960. 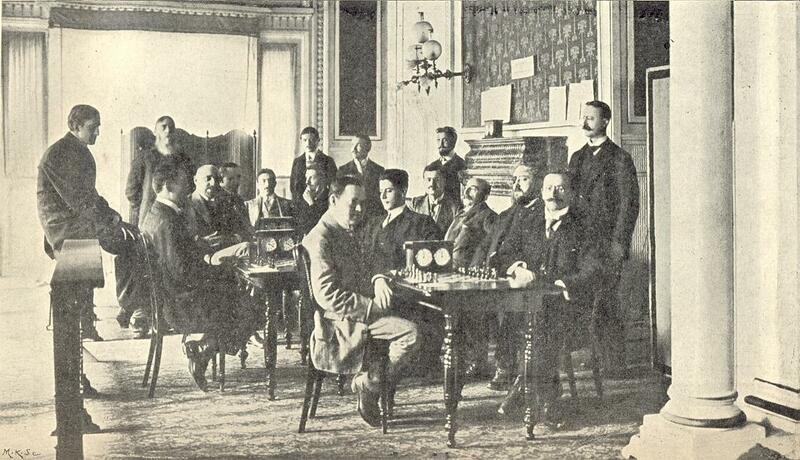 It may be wondered when 1890 started to be mentioned in chess books as the year in which Leonardo Torres y Quevedo invented his chess computer. A relatively early instance is page 13 of Chess and Computers by David Levy (London, 1976), whereas page 3 of the same writer’s Computer Chess Compendium (London, 1988) gave only 1914. 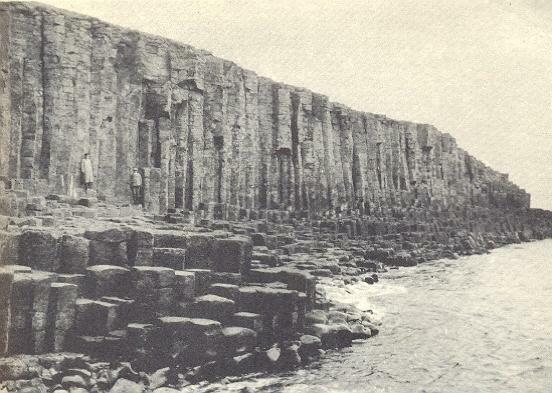 What is the connection between this photograph and chess? 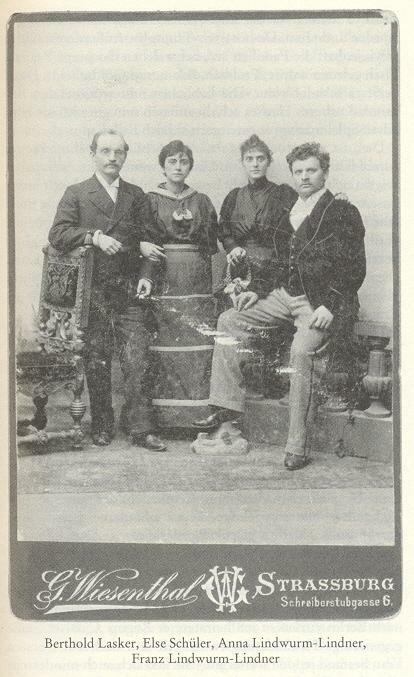 Concerning this photograph, taken at San Sebastián, 1911, Peter Anderberg (Harmstorf, Germany) considers that Schlechter was indeed present and that the top of his head is visible just above Spielmann’s. Our correspondent furthermore suggests that the picture was taken during the fifth round, on 27 February, when the pairings included Spielmann v Tarrasch (in the foreground), Capablanca v Janowsky and, at the third clock, Schlechter v Důras. Finally, Mr Anderberg remarks that an early publication of the photograph was in Die Schachwelt, 31 March 1911, page 82, with the same (incorrect) caption as in the German tournament book. ‘Chess is played with 32 pieces on 64 squares, draughts with 24 pieces on 32, so that obviously there must be many more possibilities in chess, and consequently more complications. Complications do not always mean science. Chess is a game of the opening and middlegame; checkers of the ending. Four out of every five games of chess are decided in the first 30 or 40 moves; only occasionally does a player wrest a win out of an originally even endgame. On the other hand, middlegame combinations in draughts are rare, at any rate between good players, most games being decided only in the concluding stages. A chess position is easier to size up. 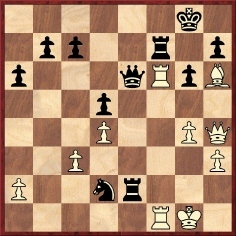 You can often find the weaknesses in one player’s game at a glance, he has a bad pawn position or an exposed king, or such like. At draughts a weakness may be most subtly concealed, only to be exploited by one single delicately-timed sequence of moves. 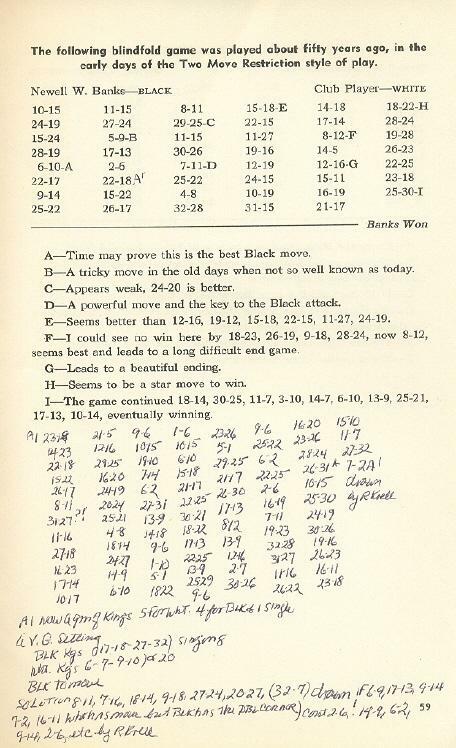 For the score of Banks’ victory over Kashdan (at Chicago, 1926), see pages 78-79 of Wonders and Curiosities of Chess by I. Chernev (New York, 1974). Banks also wrote a feature ‘Chess vs. Checkers’ on pages 13-18 of Banks’ Blindfold Checker Masterpieces (Philadelphia, 1947), from which the above photograph is taken. Some extracts follow. ‘An important point stressed by most checker players in favor of checkers is the fact that you must move forward at all times until the King Row is reached, the slightest mistake usually being fatal. In chess, on the other hand, if a minor error is made, you can retreat (except in the case of pawns) and in many cases by doing so avoid disaster. Another point often made to stress the greater precision evolved in checkers is the fact that one piece down in any normal position will lose, while in chess even king and two knights will not win against a lone king. The coupling of Rubinstein and ‘Salve’ as aspiring young players is strange; Georg Salwe was 20 years older than Rubinstein. Page 14 of our book on Capablanca presented a victory by the Cuban over a player named Schiffman in a simultaneous exhibition in Detroit on 21 January 1909, taken from the Detroit Free Press of the following day. 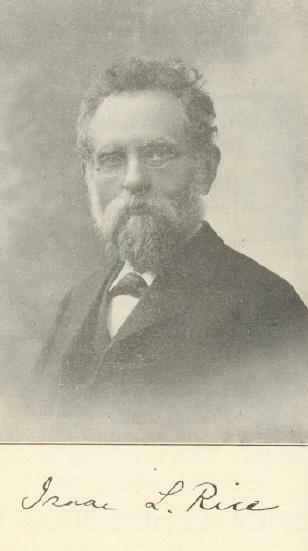 The newspaper described Schiffman as ‘the local expert’. We wonder whether this was the same Schiffman, and not least because Detroit was Banks’ native city. 39...Rd8 40 g3 Kh7 41 f5 Nc4 42 Ra2 Rd5 43 g4 Ne5 44 Rf4 Nd3 45 Rf1 Ne5 46 Ra4 c4 47 h3 Nf3 48 Rxc4 Rxd2+ 49 Ke3 Rh2 50 Rd1 Ng5 51 Rd8 Rxh3+ 52 Ke2 Rh2+ 53 Ke3 Rh3+ 54 Kd2 g6 55 f6 e3+ 56 Ke2 Ne6 57 Rd7 g5 58 Rxf7+ Kg6 59 Re7 Kxf6 60 Rxe6+ Kxe6 61 Re4+ Kd5 62 Rxe3 Rxe3+ 63 Kxe3 Ke5 64 White resigns. Regarding that victory over Jaffe (1 e4 e5 2 Nf3 Nc6 3 Bb5 a6 4 Ba4 Nf6 5 O-O Be7 6 Re1 b5 7 Bb3 d6 8 c3 Bg4 9 d3 O-O 10 Nbd2 Na5 11 Bc2 c5 12 Nf1 Qc7 13 Bg5 h6 14 Bxf6 Bxf6 15 Ne3 Be6 16 Qe2 Rfd8 17 h4 Qe7 18 g3 Qd7 19 Nd5 Bxd5 20 exd5 g6 21 h5 gxh5 22 Kg2 Qg4 23 Rh1 h4 24 Qe3 Bg5 25 Nxg5 hxg5 26 Bd1 Qf5 27 gxh4 gxh4 28 Qh6 Qg6+ 29 Qxg6+ fxg6 30 Rxh4 Kg7 31 b4 Nb7 32 Bg4 a5 33 Rah1 Rh8 34 Rxh8 Rxh8 35 Rxh8 Kxh8 36 a3 axb4 37 cxb4 c4 38 dxc4 bxc4 39 a4 c3 40 Bd1 Resigns), see the Addenda in the Dover edition of The Unknown Capablanca by David Hooper and Dale Brandreth (New York, 1993). 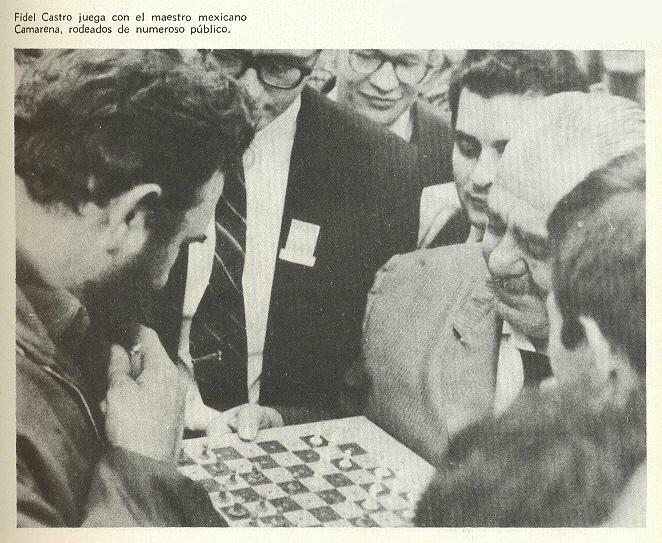 However, it is asserted there that the game ‘was recorded by Vicente Martínez de Carvajal (1840-1915), discovered amongst his papers after his death, and published in Ajedrez Español, 1953, pages 144-145’, whereas it was recorded by Capablanca himself. J.E. 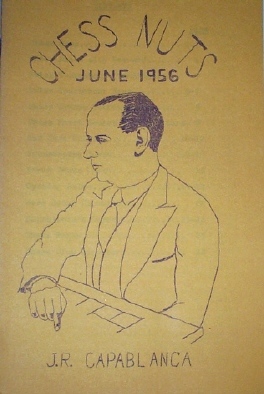 Olavide, the author of the article in question in the Spanish magazine (June-July 1953 issue), stated that he had recently acquired a collection of old papers which had belonged to Carvajal and that these included the score-sheet of Capablanca v Jaffe, written in pencil by the Cuban and with the additional information ‘20 moves an hour’. A second title has just been added to our feature article. Occasional C.N. items reproduce articles by G.H. Diggle from the two volumes of Chess Characters which we published in 1984 and 1987. The piece below first appeared in the April 1982 issue of Newsflash.